Indulge in Dark Chocolate Daily and Why It’s Good for You. It really was one of the best discoveries of modern science, when researchers discovered dark chocolate is healthy. While not exactly a vegetable, chocolate is plant-based. It’s full of health-enhancing flavonoids, antioxidants, and polyphenols. You can’t overload on it but you’ll benefit from eating a moderate amount. And by “moderate amount” we mean about an ounce a day of plain chocolate. It should be dark—at least 70 percent cocoa—not white or milk. That stuff doesn’t bear any resemblance to healthy dark chocolate. Yes, it’s delicious and healthy. Dark chocolate can actually improve the quality of your life. 1) It’s brain food – You know that healthy fats are good for your brain… But can chocolate really help keep your mind sharp as a tack? The answer is yes! According to one study, people who had two servings of hot cocoa every day for thirty days were able to complete timed cognitive testing 30 percent faster than the non-cocoa drinkers.1 Patients with restricted blood flow to the brain at the beginning of the study saw an eight percent improvement in blood flow at the end of the study.2 Eat more chocolate if you want to make the honor roll. 2) It helps prevents sunburns – Eating chocolate can actually keep you out in the sun longer. Eating chocolate rich in flavanols protects the skin from harmful UV rays3 The less processed the chocolate, the more flavanols it will contain. Of course, this isn’t an excuse to bake out in the sun. 3) It helps prevent heart disease – Are you at risk for heart disease? A study out of Scotland finds that out of nearly five thousand participants, those who ate chocolate more than five times a week lowered their risk for heart disease by 42 percent.4 This doesn’t mean you should load up on candy bars… But it does mean that you should make friends with quality dark chocolate. For your heart’s sake! 4) It helps lower inflammation – Inflammation can lead to some nasty problems in the body. These can include high blood pressure, diabetes, and heart disease. An Italian study shows that people who ate a serving of dark chocolate every three days had an average of 27 percent lower C-reactive protein levels in their blood than those who never ate it.5 C-reactive protein in the blood is a marker for inflammation, so the lower you can keep it, the better. 5) It helps lower stress – Here’s a benefit that everyone can enjoy. Researchers in Switzerland found that eating 1.4 ounces of dark chocolate per day for two weeks can reduce cortisol levels.6 Cortisol, known as the stress hormone, can mess with healthy hormone function. It also increases inflammation and can raise blood pressure. So next time you throw your feet up to relax, bring some dark chocolate with you. You’ll get double the cortisol-lowering benefit. These are some impressive benefits to eating dark chocolate. To reap the rewards, remember to eat chocolate that’s at least 70 percent cocoa and organic. Once you get used to eating 70 percent cocoa, try moving up to 80 and higher. The higher the cocoa content, the more the benefit you get. Real Chocolate Nibs made from crushed cocoa beans, these raw nibs are sweetened with low glycemic coco sugar for that perfect dark chocolate chip taste . 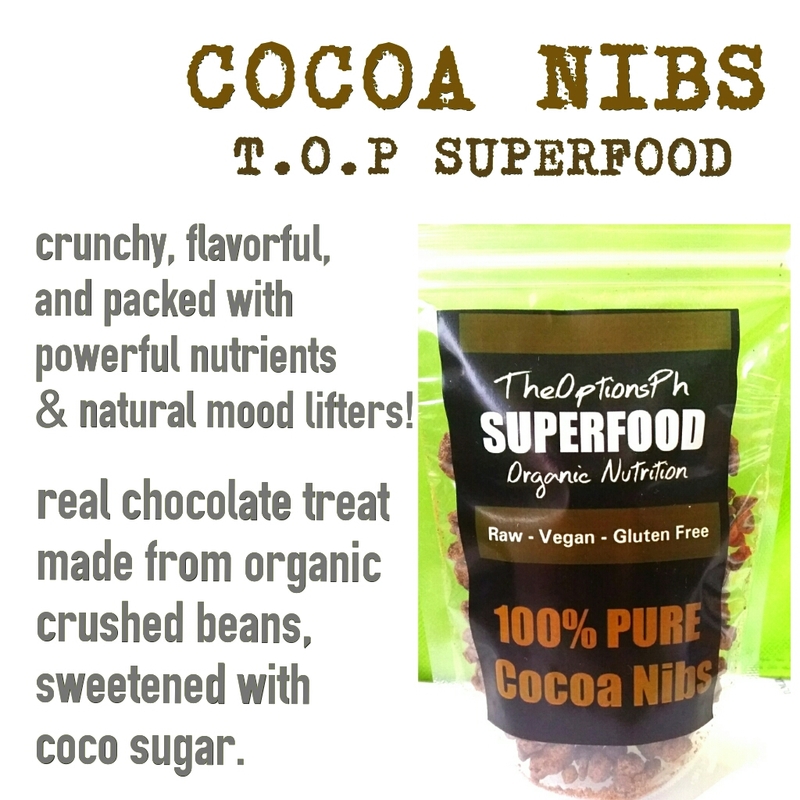 Cocoa nibs are crunchy, flavorful, and packed with powerful nutrients and natural mood lifters.